It is now well accepted that our modern lifestyle has certain implications for our health (Schaub et al., 2006), mainly as a result of our willingness to remove ourselves from the biological diversity of our natural environments (Roduit et al., 2016), while still being drawn inextricably to interact with it (Kellert and Wilson, 1995). Much of our interaction with the biological world is shaped by our interaction with the microbiological world. The bacteria, fungi, viruses, archaea and protists that comprise the microbiome of this planet, are also key to the development and normal functioning of our bodies. Our immune system is built to shepherd our microbial exposure, ensuring that microbial organisms that we need are kept close (but not too close), and that less-desirable organisms are expelled or killed before they can do too much damage. By moving from a life interacting with nature on a regular basis, to a life in which we isolate ourselves physically from natural microbial exposure, we may have instigated one of the great plagues of the 21st century; chronic immune disorders. Bacterial abundances as determined via qPCR. Our homes are microbial habitats, and although the amounts and types of bacteria in indoor air have been shown to vary substantially across residences, temporal variability within homes has rarely been characterized. Here, we sought to quantify the temporal variability in the amounts and types of airborne bacteria in homes, and what factors drive this variability. We collected filter samples of indoor and outdoor air in 15 homes over one year (approximately 8 time points per home, 2 per season), and we used culture-independent DNA sequencing approaches to characterize bacterial community composition. 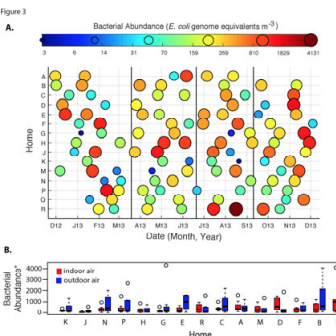 (…) Although all homes had highly variable indoor air communities, homes with the most temporally variable communities had more stable, lower average microbial loads than homes with less variable communities. 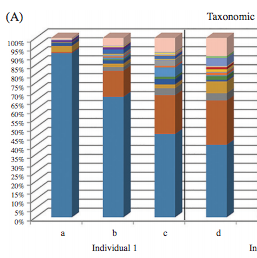 Taxonomic composition analysis at the genus level. Microorganisms flourish on and in the human body and skin surfaces are the largest. 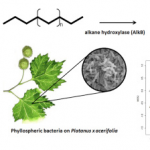 The skin surface microbiota can be transferred to an object upon touch. This has forensic implications. This study explored the hypothesis that residual skin bacteria left on fabrics could be valuable for forensic analysis. A nonculture based approach was used, since it can reveal a more diverse microbiome than culture-based methods. Fabrics examined were 100% cotton, 55% cotton – 45% polyester fabric, and 100% polyester. Three volunteers firmly grasped each fabric, and the DNA of all the samples was extracted and analyzed for the 16S rRNA gene. 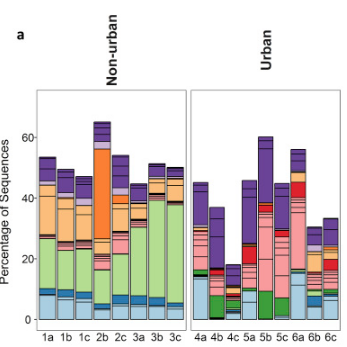 The 454-Next generation sequencing was used to observe the microbiome community relation between the individual and the fabrics in dendrogram and PCoA graph analyses. The analyses confirmed that the touched fabrics retained microorganisms from the individual. The study reveals the potential value of the approach in forensic examinations. (…) In this study, we investigated the effect of an urban environment on the bacterial composition of phyllosphere communities. We performed a passive biomonitoring experiment in which leaves were sampled from ivy (Hedera sp. ), a common evergreen climber species, in urban and non-urban locations. 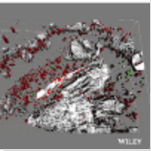 Exposure to traffic-generated particulate matter was estimated using leaf biomagnetic analyses. The bacterial community composition was determined using 16S rRNA gene sequencing on the Illumina MiSeq. (…) The results of this study indicate that an urban environment can greatly affect the local phyllosphere community composition. 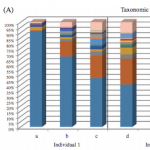 Although other urban-related factors cannot be ruled out, the relative abundance of most of the dominant taxa was significantly correlated with exposure to traffic-generated PM. Thanks for posting these! It’s very helpful to have in one place!